Wake every morning to enjoy views of the sunrise over the water -and then make yourself a feast in the fully equipped kitchen at La Grande Vigie. This villa sits in the hills above Oyster Pond and features a large pool in the center of a sprawling patio seemingly perched in the treetops. If you can convince yourself to leave, the beach and restaurants are just down the road. When you’d rather enjoy the privacy, there is a Jacuzzi tub in the master suite, plenty of space to sprawl in the living room, or you may adjourn to your individual bedroom with en-suite bath for a little R&R. Wonderful views of Oyster Pond, Atlantic Ocean & Orient Beach. 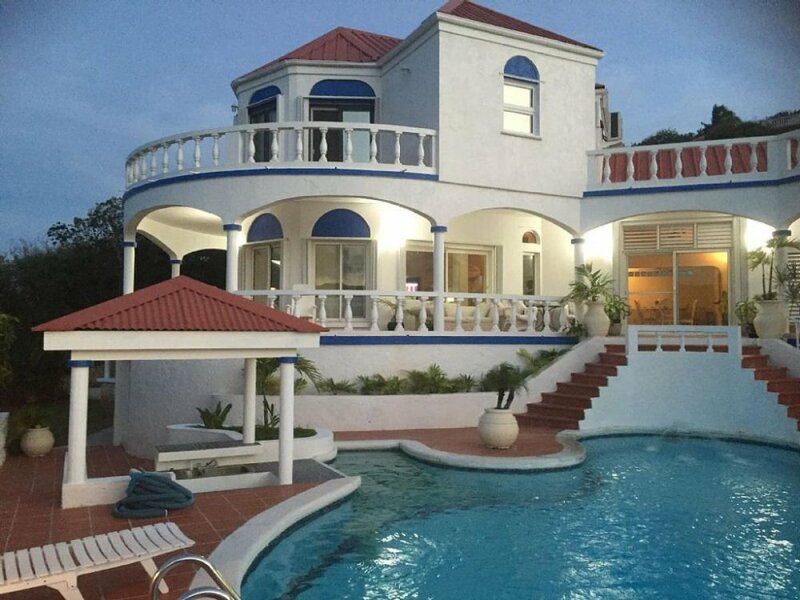 La Grande Vigie villa with 5 bedrooms and 5 1/2 baths, sits on a hillside overlooking Oyster Pond, Dutch St. Maarten. It is designed in a Mediterranean style. All 5 air conditioned bedrooms have a private bathroom. The master suite also offers a Rain shower. The free-form swimming pool has its own swim-up bar where one can have a cool drink while enjoying the sunshine and spectacular views. This villa also features Cable TV, a telephone, and fax machine, 6-day maid service, and a deluxe rating. The home is located just minutes from Dawn Beach and only a 10-minute drive to Philipsburg, the Dutch side capital. Master Bedroom-King Bed, air-conditioning, ceiling fan, TV/VCR, en-suite bathroom with Jacuzzi/shower and terrace. Bedrooms #2, 3 & 4-Each bedroom has a queen bed, air-conditioning, and en-suite bathroom with shower, each opening onto the pool deck. Bedroom #5-Located in a separate guest house with a small kitchen, living area, bedroom with queen bed, bathroom with shower, and private terrace. The living room features modern furnishings, ceiling fans, and dining table that seats 8 persons. The fully equipped kitchen includes a stove, oven, fridge, ice machine, microwave, blender, toaster and coffee maker. The free-form swimming pool with its own swim-up bar and bar stools overlooks the wonderful views of Oyster Pond, the Atlantic Ocean, and Orient Beach. The Princess Juliana International Airport is 8 miles from Le Grand Vigie Villa; Philipsburg, the Dutch capital is 3 miles; Marigot, the French capital is 7 miles; and the Nearest Casino is located 3 miles away in Philipsburg. There is a safe in each bedroom. Just a few minutes drive down to Dawn Beach.